Motorhome Covers: Who Needs Them? Question: Are motorhome covers really necessary? I’m a new motorhome owner, and just driving around town, I’ve seen a lot of people with motorhome covers. I also see a lot of people who don’t put motorhome covers on their rigs, though, so I’m wondering if they’re really necessary. It seems like a pretty big hassle to put it on and take it off every time we go camping (especially since I’ll probably end up doing it myself), so I’d like to avoid it if I can. While motorhome covers aren’t strictly necessary, they are a great way to protect your investment. The problem is that when your motorhome sits out in the elements, year in and year out, there are a lot of things that are subject to wear. If you have an EDPM or TPO roof, they will break down and wear out faster when exposed to the elements, and the paint on a fiberglass roof will also fade, oxidize, or peel faster if it’s out in the sun and rain all year long. The caulking around roof vents, the vents themselves, your A/C unit, and basically everything else on the exterior of your rig will all wear out faster as well if they’re constantly exposed to the elements. Motorhome covers are available in a number of styles and fits. If you have the room on your property, you might want to consider a free-standing RV shelter. These are sort of like carports for motorhomes, and they provide at least some protection from the elements. At the very minimum, the roof of the shelter will keep the sun off your motorhome’s roof. If you get a shelter that has walls, it will provide even more protection. In case you don’t have that kind of space (and most people don’t), then getting a motorhome cover really is worth the investment (both in money and the time it takes to put on and take off.) You don’t have to put the cover back on every time you get back from a camping trip, but you should think about installing it if you don’t plan on using the rig for a few weeks or a longer period of time. 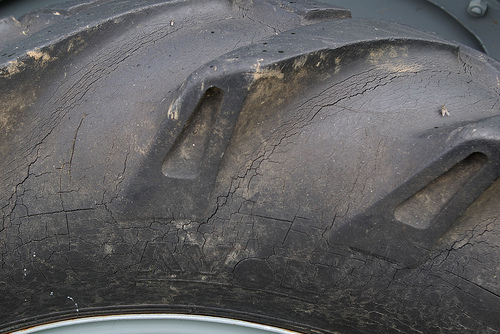 Weather-cracked tires may need to be replaced long before the tread wears out. Since most people don’t put as many miles on their motorhome as they do on their daily driver, motorhome tires tend to last a lot longer than passenger car tires. If you want to get the most out of your tires, then it’s worth remembering that they’re made out of rubber, which is also subject to wear when exposed to the elements. That usually doesn’t become an issue on passenger cars and trucks, since those tires tend to wear out before the rubber really starts to break down, but it can be an issue with a rig that’s parked a lot of the time. In order to prevent weather cracking, UV degradation, and other issues, you might want to consider investing in a set of wheel covers. Some motorhome covers go all the way down to the ground, in which case separate wheel covers aren’t necessary. However, a lot of covers stop a foot or more above the ground, which leaves the wheels exposed to the elements. In that case, slipping on some wheel covers will protect your tires and probably save you a lot of money in the long run. Next story Motorhome Drivers License: Who Needs One? Previous story What Are Class B Plus Motorhomes?